Lamp Doctor in the News! Peter Romeo, Lampmaker: "It's got to be perfect... not that everything else isn't." You could say Peter Romeo is pretty passionate about his lamps. Every day he literally lights up with ideas. "Flicker, flicker flame!" That flame has kept him in business for 33 years in Midwood. He is the lamp doctor. He fixes what's broken and creates fixtures out of anything. Romeo: "We have hunters who come in with antlers. They know we create things, so we made a chandelier for one. He told his friends and we had the whole lodge." For a more feminine touch, they add crystals to antlers. Ships are big sellers. He gives a new spin to keepsake ballerinas, angels, cups, saucers and old bottles. Even gargoyles get a new look. Before Romeo created lamps, he was a Navy photographer. He showed us one of his cameras. Romeo: "I don't sell this one but if a customer brings in an old camera, I'll mount his... I really don't want to part with it." A gumball machine when filled may be too much of an attention grabber for kids. Romeo: "We made one for someone with two kids and they started to.... wreck the chandelier." Speaking of wrecks, Olga Rahibi brought in hers knowing the doctor can remedy the problem. Olga Rahibi, Customer: "I get all antiques and get them fixed and do some restoration and it's perfect." Romeo has plenty of help and over the years he's created 5,000 one-of-a kind pieces. Glassberg: "You said you can make a lamp out of pretty much anything..."
Romeo: "Ohhh no, a Ken doll?" Glassberg: "You can do it?" Romeo: "Sure. No problem. You want it to match, you want matching colors?" There he goes with ideas again; ready to illuminate anything. Romeo: "Ahh, let there be light." We were also recently featured in a Newsday piece written by Merle English. This piece was syndicated and ran nationwide. Click on the pictures below to read it. We have also been featured in Denis Hamill's Column in the New York Daily News. Click the pictures below to read more. 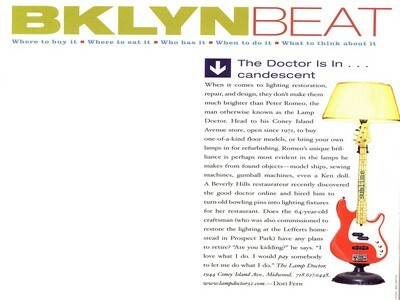 Most Recently Lamp Doctor made an appearance in BKLYN Magazine in a small piece about our custom one of a kind designs. Click the picture below.